Even though the NHL lockout is nearing it’s fourth month with no end in sight, hockey fans all over the world have one upcoming annual tournament to look forward to: the World Junior Hockey Championship. Every late December and early January the best hockey players under the age of 20 from the strongest hockey nations get together to partake in a tournament that provides some of the most entertaining action that the sport has to offer. Many of the NHL’s biggest stars have played in the World Juniors, and many future stars will compete against each other again in this year’s competition. The WJCs also provide a great and rare opportunity for fans of most NHL teams to watch their team’s top prospects in action. The Dallas Stars are no exception, and have a handful of promising youngsters that have very good chances of representing their respective countries beginning in December. Brett Ritchie (2nd round, 44th overall, 2011) of the Niagara IceDogs has not only been one of the biggest breakout players in the OHL this year, but in all of Canadian major junior hockey. 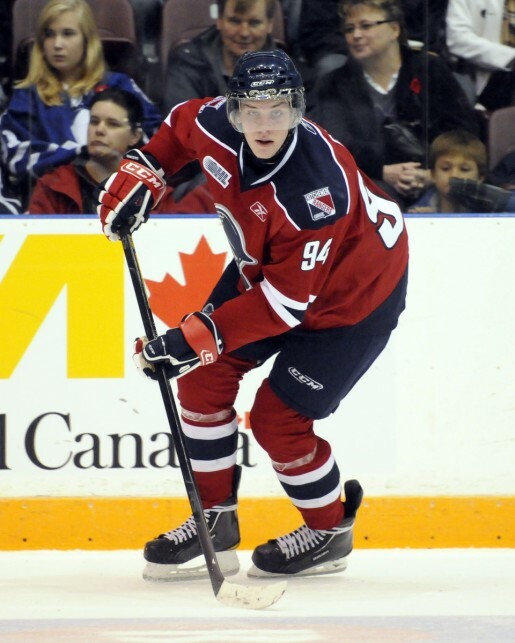 The huge 6’4,” 215-pound power forward has 22 goals, 21 assists and a +25 rating in just 28 games, and his 43 points currently rank him third in the OHL behind only IceDogs teammate Ryan Strome and Seth Griffith of the London Knights. Strome had nine points in six games for Team Canada at last year’s WJCs, and is a lock to make the squad again this year. Considering Strome and Ritchie, both 19, have become the OHL’s most dominant one-two offensive punch this season by a wide margin, not only is it very likely that both make the team and continue to play together, but there’s a good chance that the duo could even get the opportunity to unleash their chemistry on their opponents as two-thirds of Canada’s top line. As the highest drafted Czech player since Jakub Voracek went 7th overall in 2007, it’s safe to say that Radek Faksa (1st round, 13th overall, 2012) will be a lock for the Czech WJC team this year. The big, cerebral, two-way center hasn’t put up the strongest numbers so far this season for the Kitchener Rangers in the OHL (22 points in 24 games), but has excellent shooting, passing and puck control skills. It will be his elite-level defensive play, however, that could make Faksa, 18, the anchor on his nation’s first line. He’s been tasked with shutting down top opposing lines this season in the OHL, so he will be an ideal candidate to do the same against other countries’ best firepower on the international level. A smooth-skating, puck-moving defender that holds his own at both ends of the ice, the 18 year-old Ludvig Bystrom (2nd round, 43rd overall, 2012) has been plying his trade against older competition in the Swedish Elite League the last two seasons and hasn’t looked out of place. He has two goals, two assists and a +4 in 21 games so far this season with Modo and has been getting increasing playing minutes as the season goes on. As one of the highest-selected Swedish defencemen in the last two drafts, Bystrom is an obvious choice to make the defending-champion Swedes, but with injuries to other national defencemen Jonas Brodin and Oscar Klefbom that will likely prevent them from playing in this year’s tournament, Bystrom’s chances of making the team and playing an integral role are quite high. Despite being a late draft choice (6th round, 165th overall, 2011), winger Matej Stransky, 19, has been an incredibly pleasant surprise for the Dallas Stars. Possessing good size and puck control, Stransky scored an impressive 81 points in 70 games last season for the WHL’s Saskatoon Blades, and is continuing at a healthy pace this season with 24 points in 25 games. Though the Czechs normally prefer selecting individuals that play in the Czech Republic leagues, Stransky’s combination of size, age and experience playing against North Americans could make him a valuable commodity for their roster. Going on numbers alone, Esa Lindell’s (3rd round, 74th overall, 2012) zero points and -9 rating in 19 SM-liiga games for Jokerit Helsinki might seem like he isn’t a high-level player. But 18 year-old defencemen playing in Finland’s top league are a rarity, and Lindell possesses great size at 6’3″ and was an elite point-producer playing in the Jr. A SM-liiga thanks to a heavy slapshot. Though a long shot to make the team due to this season’s stats, Lindell has experience against tough competition and possesses enough raw skills to make a solid case for himself.